Plot Summary: In the future, a man named Sakura is destined to create the technology for eternal life, which (due to Sakura's lolicon tendencies) freezes all women's aging once they turn twelve. God refuses to allow this, so he sends his angels to the past to kill Sakura before he can do this. 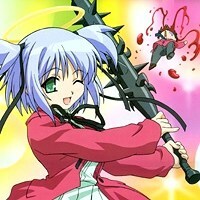 But one angel, Dokuro-chan, decides to try to change the future without killing him. Problem is, Dokuro is very temperamental, and is constantly killing Sakura (and lots of other people too) in incredibly bloody ways with her giant spiked club. Good thing she can bring people back to life - if only to grusomely kill them again the next time she loses her temper. Although there are technically 8 episode titles, these were aired as 4 TV episode segments. Each half-hour broadcast of Dokuro-chan contains 2 13-minute episodes. They each have a separate title, but the OP and ED are each played only once, and the two parts are related. The subtitled-only DVD release listed below also includes the follow-up OVA episodes.